SOMERSET, KY - Today, U.S. Representative Hal Rogers (KY-05) announced the winners of the 2014 Congressional Art Competition for Kentucky’s Fifth Congressional District. The first place artwork, entitled “#Selfie #Uncentered,” was painted by Reagan Smith, a senior at Corbin High School. Reagan utilized watercolors to create her self-portrait. Her art teacher is Brenda Daniel. Reagan is the daughter of Gwen Lickliter of Corbin, Kentucky. Reagan's artwork will be displayed in the Cannon Tunnel of the U.S. Capitol Building for one year where it will hang alongside artwork from congressional districts across the nation. She will also attend a Congressional Art Competition reception for winning artists from across the country on June 25, 2014 in Washington, D.C., and will receive two complimentary airline tickets to attend. Additionally, Reagan is also eligible for an art scholarship of $3,000 per year from the Savannah College of Art and Design in Georgia, where she has already been accepted for enrollment. 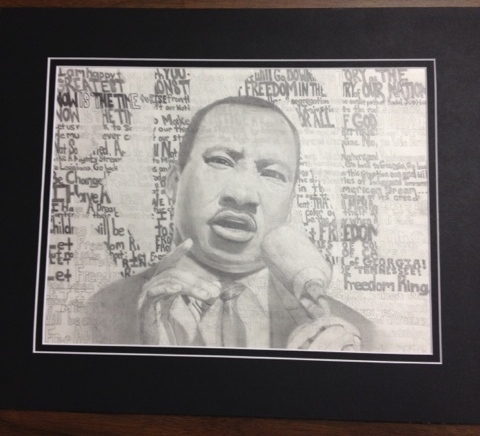 The second place artwork, entitled "Rise Above It" was drawn by Allissa Moe, a junior at Betsy Layne High School. The artwork is a pencil portrait of Dr. Martin Luther King, Jr. with his famous "I have a dream" speech written in the background. Allissa darkened the word "Rise" to stand out as a message to the viewer. Her art teacher is Shannon Shepherd. Allissa is the daughter of Thomas and Dorian Moe of Harold, Kentucky. The third place artwork, entitled "Still Life with Vase of Roses" was drawn by Matthew Hackler. The artwork is an intricate ebony pencil drawing of a still life arrangement. Matthew is a Senior at McCreary Central High School. His art teacher is Rose Fey. Matthew is the son of Tonya Hackler of Pine Knot, Kentucky. To view all of the entries from Kentucky's Fifth Congressional District, visit Rogers' online photo gallery athttp://halrogers.house.gov/photos.